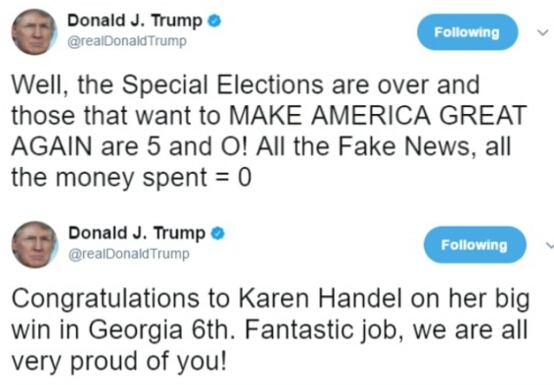 Donald Trump on June 21, 2017 congratulated Karen Handel on her big win in Georgia. "Fantastic job, we are all very proub of you", He said. Meanwhile, on those that like sharing fake news, Mr president has zero tolerance on them.
" Well, the special elections are over and those that want to make America great again are 5 and 0! All the fake news, all the money spent=0", he said. 0 Comment to "Donald Trump trolls Democrats on Twitter with Karen Handel’s victory in Georgia"